Evernote clearly is also available as an add-on for firefox. It is indeed an awesome tool! I hope there will be an iOS version soon. Excellent service! I use it for both my android and iphone. Cool! Clearly is just another profound invention great for readers. I’m happy it’s free at the moment. 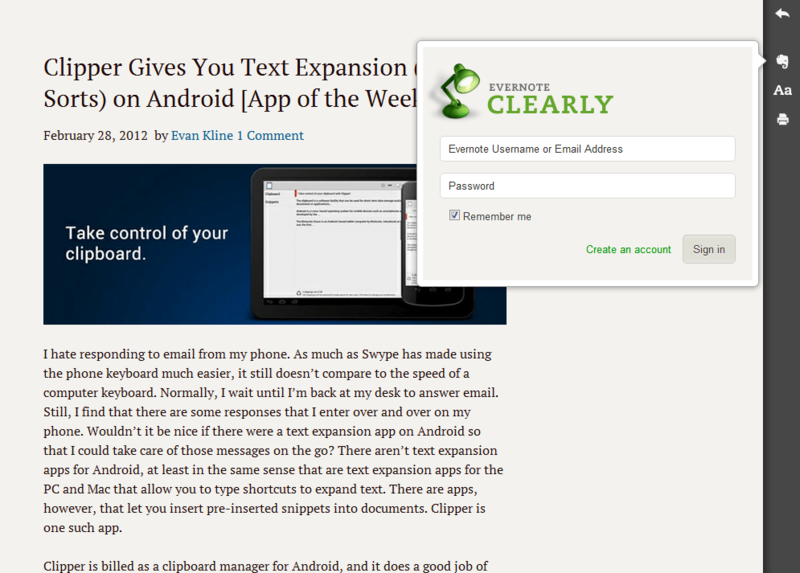 How long have you used clearly? Thanks for sharing it here. I just came across it last week. The day I wrote the post, actually. Definitely loving it! Bobby – I love Clearly, when it works. Which is not all the time. I haven’t experienced any problems with it, yet. There was a weird little thing in the beginning, getting the send to Evernote button to work, but nothing since then. Where do you find issues? I’m a big fan of Readability, which I’ve been missing ever since I moved to Chrome (Safari’s Reader feature is superb and I still use it in Mobile Safari). Clearly looks extremely slick! I like the custom looks — especially the dark theme for night (I’m on 27″ desktop). I just discovered Clearly, also, and blogged on it (and pointed to your blog entry in the comments). It is brilliant. What browser do you use on iOs? I use Safari and I use Reader (built in) on my handheld. I use it in the same way I use the Clearly extension on my desktop. I use Safari on my iPhone — and the Reader capability is pretty cool, and combined with your Evernote email address, you’re definitely in pretty good shape. I tend to use Atomic Browser on my iPad, though — Safari is still wayyyyy too crash-happy. 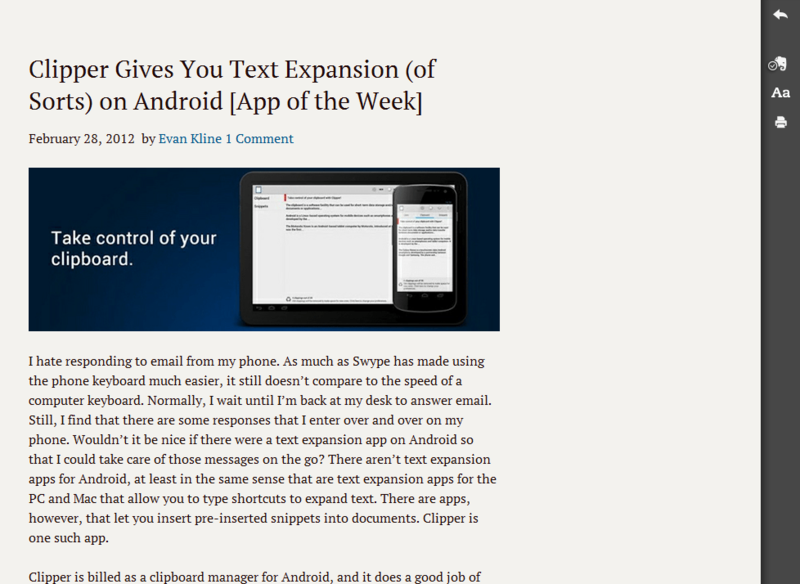 OK, I tried Clearly and sent a ‘clipping’ to Evernote, then accessed it in iOS. Unfortunately, how it’s displayed in Evernote iOS isn’t quite as nice as Clearly in Chrome. No options like black background, for instance. It’s still a very reasonable solution, but having the Clearly formatting options within the Evernote app would just blow my mind! That would be cool — and should be possible, I would think. Maybe Evernote will get to that in an update. 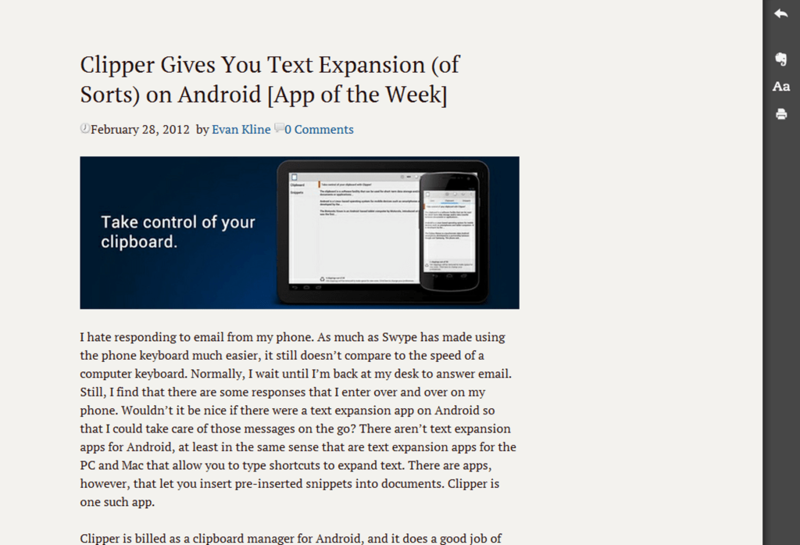 The transfer to EN is definitely better than clipping with the Evernote browser extension, though. I am not as impressed by Clearly. For one thing, not even a bookmarklet for Safari (Instapaper, ReadItLater and Redability all support Safari with extensions or bookmarklets). 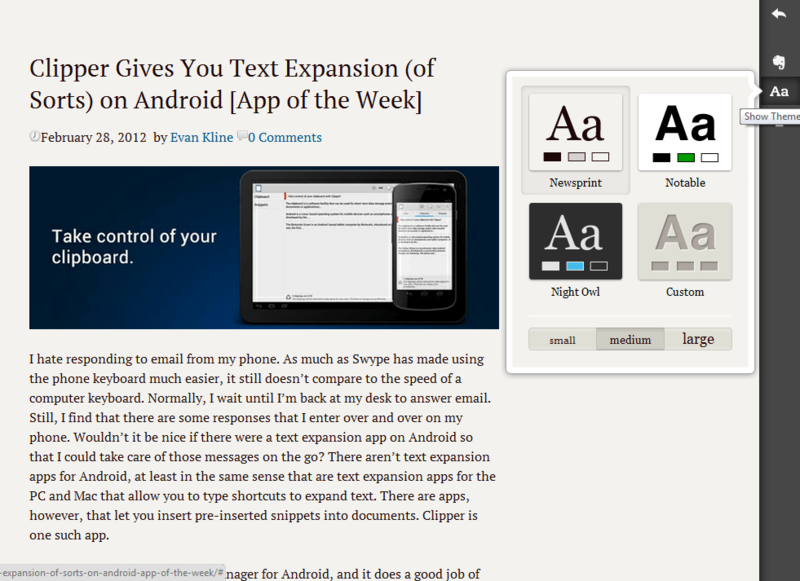 Also, Instapaper has long supported saving article text to Evernote. 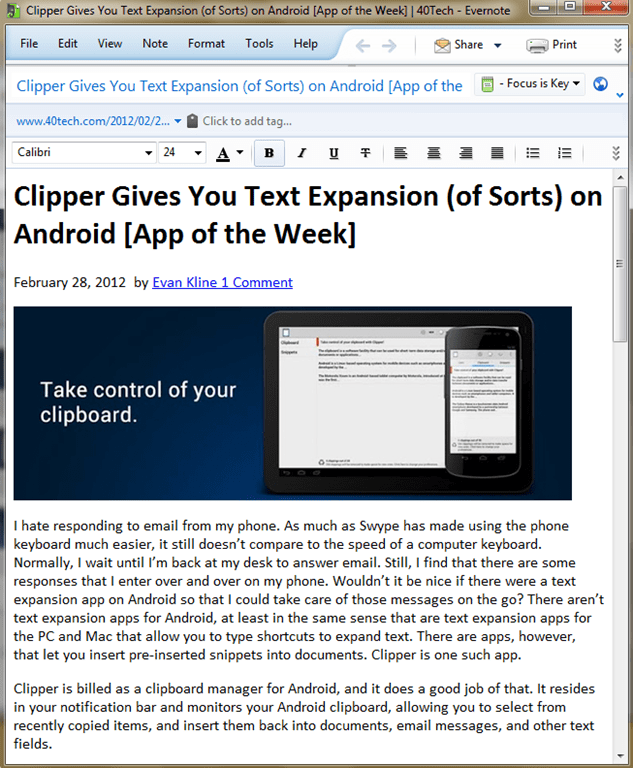 You can either do it manually per article, or have a “star”ed article automatically exported to Evernote. I have been using it for a long time, with great success. Does anyone know if Readability or Clearly sends the article to a server first before rendering? I’m using Firefox, and I tried Readability and the URL changes once you activate the reader mode. With Clearly the URL doesn’t change, so it seems that everything stays local to my computer. Does anyone know? I’ve tried out a lot, like Pocket(new read it later), Instapaper, Evernote. but lately I found a new web clipper on the chrome store called waveface stream, and it has some great perks. Evernote clearly has the win on saving and editing even sharing. Pocket, Instapaper, and clearly has the reading list part covered nicely. 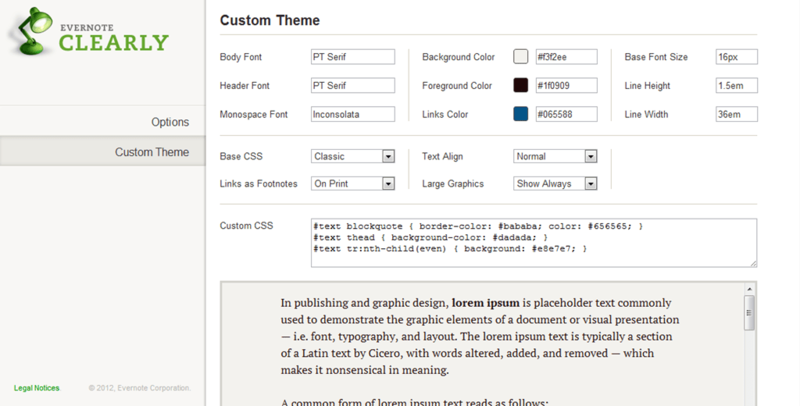 I have found that Readability renders pages much cleaner and faster in Firefox than Clearly.